We create value by applying our intellectual resources to meet our tenants’ expectations, manage our assets and develop the Waterfall precinct. Although not under our direct control, we also apply our intellectual resources to influence and support the management teams of MAS and AttAfrica. Design an optimal information technology architecture, with specific focus on how we manage our Waterfall development. FTSE Russell (the trading name of FTSE International Limited and Frank Russell Company) confirms that Attacq Limited has been independently assessed according to the FTSE4Good criteria, and has satisfied the requirements to become a constituent of the FTSE4Good Index series. Created by the global index provider FTSE Russell, the FTSE4Good Index series is designed to measure the performance of companies demonstrating strong environmental, social and governance (ESG) practices. The FTSE4Good indices are used by a wide variety of market participants to create and assess responsible investment funds and other products. The collective knowledge of our people powers our business philosophy and enables us to realise our objectives. Their skills and energy add value to our store of human capital while their innovations and expertise support our store of intellectual capital. For both capitals, the contributions of our people generate outcomes that support the business of Attacq, which in turn enables the company to deliver benefits for all stakeholders, starting with our people. Our corporate culture is founded on the success and motivation of individuals, understanding that motivated people become a collective force, focused on continual improvement. 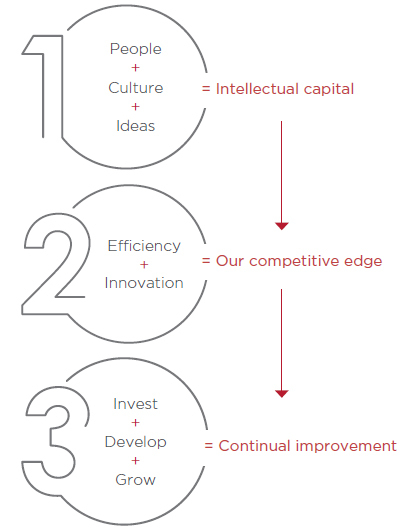 Effectively deploying intellectual capital is the heartbeat of who we are as a company. We are uniquely positioned as one of the only REITs with access to significant development opportunities. For our people, this presents challenges and opportunities for growth, translating into sustainable returns for shareholders and sustainable benefits for all stakeholders. In terms of applying our intellectual capital to our strategic pillars of invest, develop, grow, highlights of the review period are summarised below. Given their overlapping nature, we have not separated our activities under a specific pillar. We continue to attract top-tier tenants to Waterfall based on its unique location, our excellent relationships in the market and ability to move swiftly. Given the sluggish economy, we creatively tailor deals to suit the requirements of new tenants and our growth strategy. Innovative thinking is required to efficiently fund our portfolio and development pipeline. As we own the process from inception to conclusion, we ensure sustainable solutions are aligned with our strategy and unlock shareholder value. Attracting well-known tenants, namely: Accenture, Cummins, Pirtek, Superga/Kappa and Zimmer Biomet. We develop quality buildings, all originating from great ideas and all delivered on time and within budget. By embedding sustainability into the design of each building, we are reducing environmental impact while increasing operational efficiency across its lifecycle. Our 360° approach to identifying, constructing and managing each asset ensures our tenants can relocate smoothly to their new corporate homes in the Waterfall precinct. 2018 SAPOA design awards for PwC Tower, BMW building, the South African Institute of Civil Engineering 2018 award for structural engineering and overall technical excellence. In a challenging economy, we have some of the lowest portfolio vacancy rates in our industry. We believe this reflects the strength of our relationships and teams focused on delivering outstanding service to our tenants and shoppers alike. How do we know if we are providing a great service? By investing in technology and analytics, we have a consolidated view of all issues that may detract from our tenants' experience. We quantitatively track a range of metrics from occupational health and safety requirements to how long it takes to change a light bulb for a tenant. Our proactive asset management approach, enhanced by the latest technology and trend analysis, maintains the high level of demand by shoppers and tenants alike, ensuring steady capital growth across our portfolio. Identifying new income streams, apart from traditional rental income, is key in our competitive environment. We are successfully marketing common spaces for pop-up stores, advertising, social and media events and exhibitions. Management systems – by engaging with stakeholders, we identify their information requirements. Our flexible approach addresses these changing requirements by pooling all our data to enable users to extract what they need. In addition, they benefit from trend analysis for informed insight that drives tactical changes. To enhance "business as usual" operations and efficiencies for all staff, we have deployed specific tools across the portfolio to unlock further synergies. To mitigate the growing trend of data breaches and cyber-security incidents, proactive security and network protection measures are in place. Successful pilot of work-request and incident-handling system, MyBuildings, being deployed across our portfolio. A pilot programme using the MyBuildings mobile app as an operations management tool was implemented at Garden Route Mall. Following its success, we are rolling this out across our buildings. In South Africa, we have 1 056 tenants spread over 802 256m2 of lettable area. Managing their needs is a daily operational requirement but how well we do so is fundamental to our sustainability. To put this into context, a leaking tap is an irritation and waste of natural resources: fixing it fast addresses both issues. At the other end of the spectrum, a roof collapse after a hailstorm is a catastrophic event that tests our emergency response and disaster recovery planning. The common thread is fast, accurate information, effective response and close monitoring. The MyBuildings app gives management real-time information that tenant needs are being addressed promptly. Outstanding issues can be tracked centrally, continuously improving tenant and customer service. In the pilot project, we collected large volumes of operational data, which translated into meaningful management insight when combined with advanced data and analytics tools. From query resolution time to balancing workloads across responsible employees, technology is simplifying the property management process. This is illustrated by actual dashboards below.